Elements are classified on the basis of similarities in their properties. Döbereiner grouped the elements into triads and Newlands gave the Law of Octaves. Mendeléev arranged the elements in increasing order of their atomic masses and according to their chemical properties. Mendeléev even predicted the existence of some yet to be discovered elements on the basis of gaps in his Periodic Table. Anomalies in arrangement of elements based on increasing atomic mass could be removed when the elements were arranged in order of increasing atomic number, a fundamental property of the element discovered by Moseley. Elements in the Modern Periodic Table are arranged in 18 vertical columns called groups and 7 horizontal rows called periods. Elements thus arranged show periodicity of properties including atomic size, valency or combining capacity and metallic and non-metallic character. Question 1. Did Döbereiner’s triads also exist in the columns of Newlands’ Octaves? Compare and find out. Answer. Yes, Dobereiner's triads also exist in the columns of Newlands' Octave. For example, Li, Na, K is a triad of Dobereiner which also exists in the columns of Newlands' Octaves. Question 2. What were the limitations of Döbereiner’s classification? Dobereiner could not classify all the elements known at that time. Dobereiner could identify only three triads from the elements known at that time. So the system of classification into triads was not accepted. Question 3. What were the limitations of Newlands’ Law of Octaves? Newlands' Law of Octaves was applicable only up to calcium. After calcium the eighth element did not possess properties similar to that of the first. Newlands assume that only 56 elements existed in nature and no more elements would be discovered in the future. Newlands' Octaves contains only few elements having similar properties. Question 1. Looking at its resemblance to alkali metals and the halogen family, try to assign hydrogen a correct position in Mendeléev’s Periodic Table. Question 2. To which group and period should hydrogen be assigned? Consider the isotopes of chlorine, Cl-35 and Cl-37. Question 1. Would you place them in different slots because their atomic masses are different? Question 2. Or would you place them in the same position because their chemical properties are the same? Answer.Yes, both the isotopes are placed in same position because they have same chemical properties and same atomic number. Question 3. What were the criteria used by Mendeléev in creating his Periodic Table? Answer. (i) He arranged the elements on the basis of their increasing atomic masses. (iii) The formulae of hydides and oxides formed by an element were treated as one of the basic property of an element for the classification used by Mendeleev. Question 4. Why do you think the noble gases are placed in a separate group? Question 1. How were the positions of cobalt and nickel resolved in the Modern Periodic Table? Question 2. How were the positions of isotopes of various elements decided in the Modern Periodic Table? Question 3. Is it possible to have an element with atomic number 1.5 placed between hydrogen and helium? Question 4. Where do you think should hydrogen be placed in the Modern Periodic Table? Question 1. Look at the group 1 of the Modern Periodic Table, and name the elements present in it. Hydrogen (H), Lithium (Li), Sodium (Na), Potassium (k), Rubidium (Rb), Cesium (Cs) and Francium (Fr). Question 2. Write down the electronic configuration of the first three elements of group 1. Question 3.What similarity do you find in their electronic configurations? Question 4. How many valence electrons are present in these three elements? Question 1. If you look at the long form of the Periodic Table, you will find that the elements Li, Be, B, C, N, O, F, and Ne are present in the second period. Write down their electronic configuration. Question 2. Do these elements also contain the same number of valence electrons? Question 3. Do they contain the same number of shells? Question 1. How do you calculate the valency of an element from its electronic configuration? Valency of metal : It is same as the number of valence electron i.e. 1, 2, and 3. Valency of non-metal : Valency of non-metals can be calculated by subtracting number of valence electrons from 8 (i.e. 8- number of valence electrons). Question 2.What is the valency of magnesium with atomic number 12 and sulphur with atomic number 16? The valency of Sulphur is 8-6 = 2 because it is non-metal. Question 3. Similarly find out the valencies of the first twenty elements. Question 4. How does the valency vary in a period on going from left to right? Answer. Valency first increases 1 to 4 then decreases from 4 to 0 (1, 2, 3, 4, 3, 2, 1, 0). Question 5. How does the valency vary in going down a group? Answer. Valency remains the same because valence electrons do not change on going down in a group. Question 1. Arrange them in decreasing order of their atomic radii. Question 2. Are the elements now arranged in the pattern of a period in the Periodic Table? Question 3.Which elements have the largest and the smallest atoms? Question 4. How does the atomic radius change as you go from left to right in a period? Question 1. Study the variation in the atomic radii of first group elements given below and arrange them in an increasing order. Question 2. Name the elements which have the smallest and the largest atoms. Ca (Calcium) has largest atom. Question 3. How does the atomic size vary as you go down a group? Question 1. Examine elements of the third period and classify them as metals and non-metals. The elements having 1,2,3 valence electrons are metals while the elements having 4,5,6,7,8 valence electrons are non- metals. Question 2. On which side of the Periodic Table do you find the metals? Question 3. On which side of the Periodic Table do you find the non- metals? Question 1. How do you think the tendency to lose electrons will change in a group? Question 2. How will this tendency change in a period? Answer. The tendency of lose electrons decreases as we go left to right in a period. Question 1.How would the tendency to gain electrons change as you go from left to right across a period? Answer. The tendency of gaining electrons increases as we go left to right in a period upto 17th group. It decreases in 18th group. Question 2. How would the tendency to gain electrons change as you go down a group? Answer. The tendency of gaining the electrons decreases as we go down a group. Question 1. How could the Modern Periodic Table remove various anomalies of Mendeléev’s Periodic Table? Answer. (i) In Modern Periodic Table, the place of hydrogen is justify because it is electropositive and so it is placed in first group with metals. (ii) In Modern Periodic Table, the elements are arranged on the basis of atomic number. So the place of isotopes is also justified as the atomic number remain same of all the isotopes. (iv) The position of inert gases is also justified. Question 2. Name two elements you would expect to show chemical reactions similar to magnesium. What is the basis for your choice? Answer. Calcium (ca) and Barium (Ba), as these two elements belong to same group as magnesium and have same valence electrons as magnesium has. Answer. Helium (He), Neon (Ne), Argon (Ar). Question 4. (a) Lithium, sodium, potassium are all metals that react with water to liberate hydrogen gas. Is there any similarity in the atoms of these elements? Question 4. (b) Helium is an unreactive gas and neon is a gas of extremely low reactivity. What, if anything, do their atoms have in common? Question 5. In the Modern Periodic Table, which are the metals among the first ten elements? Answer. Lithium, Beryllium, Boron are the metals in Modern Periodic Table among the first ten elements. Question 6. By considering their position in the Periodic Table, which one of the following elements would you expect to have maximum metallic characteristic? Answer. Be has the maximum metallic characteristics because all other elements are situated at the right hand side in periodic table than Be. Due to the position their metallic characteristics decreases as we go from left to right. Question 1. Which of the following statements is not a correct statement about the trends when going from left to right across the periods of periodic Table. (a) The elements become less metallic in nature. Answer. (c) The atoms lose their electrons more easily. Answer. (b) Mg, X would most likely be in the same group of the Periodic Table as magnesium (Mg) due to strong ionic bonding between Magnesium and Chlorine. .
Answer. Neon (Ne) , Neon has two completely filled shells with 2 electrons in K shell and 8 electrons in L shell. Answer. Silicon (Si). Silicon has a total of three shells. K shell has 2 electrons, L has 8 and M i.e. valence shell has 4 electrons. .
Answer. Carbon (C) has electronic configuration of 2 electrons in K shell and 4 electrons in L shell. Clearly, it has twice as many electrons in its second shell as in its first shell . Question 4. (a) What property do all elements in the same column of the Periodic Table as boron have in common? (i) Both are good conductor of electricity. Question 4. (b) What property do all elements in the same column of the Periodic Table as fluorine have in common? (ii) Both are bad conductor of electricity. Question 5.An atom has electronic configuration 2, 8, 7. Answer. It belongs chemically to F (9) because the electronic configuration of F is 2, 7 and having same valence electrons. Answer. C is non-metal because it belongs to 17th group. Answer. C is less reactive than A because the reactivity of non-metal decreases from top to bottom. Question 7. Nitrogen (atomic number 7) and phosphorus (atomic number 15) belong to group 15 of the Periodic Table. Write the electronic configuration of these two elements. Which of these will be more electronegative? Why? Answer. Atomic number of Nitrogen is 7 and electronic configuration is 2, 5. Atomic number of Phosphorus is 15 and electronic configuration is 2,8, 5. Phosphorus will be more electronegative because phosphorus and nitrogen both are non-metals. Phosphorus is situated in the lower side than Nitrogen. In non-metals, as we go top to bottom the electronegativity is increased. Question 8. How does the electronic configuration of an atom relate to its position in the Modern Periodic Table? Answer. The electronic configuration is related to the position of element in periodic table. The numbers of electrons in outermost shell show the number of group and the number of shells show the number of periods. Question 9.In the Modern Periodic Table, calcium (atomic number 20) is surrounded by elements with atomic numbers 12, 19, 21 and 38. Which of these have physical and chemical properties resembling calcium? Answer. Atomic number of Calcium is 20 and its electronic configuration is 2, 8, 8, 2. To see the resemblance with Calcium, first we have to check the Electronic Configuration of respective elements. Question 10. Compare and contrast the arrangement of elements in Mendeléev’s Periodic Table and the Modern Periodic Table. (i) Mendeleev's Periodic Table is based on atomic mass while Modern Periodic Table is based on atomic number. 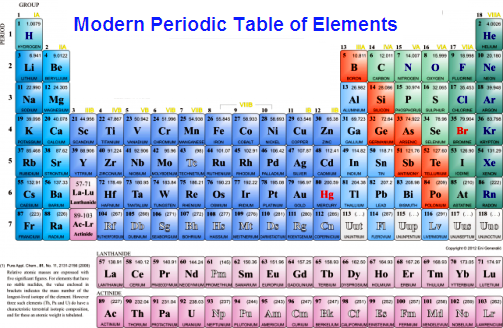 (ii) In Medeleev's table there is no place for inert gases, while in modern Periodic Table they are classified. (iii) In Modern Periodic Table all the anomalies of Mendleev's Periodic Table are removed. (iv) There are 18 groups in Modern Periodic Table. Question 1: The elements of 3rd period will have _ _ _ _ _. Question 2: Which element has zero electron affinity in the 3rd period ? Question 3: An element has configuration 2, 8, 1. It belongs to, _ _ _ _ _. Question 4: At the end of each period the valence shell is _ _ _ _ _. Question 6: The non-metallic element present in the third period other than sulphur and chlorine is _ _ _ _ _. Question 7: The family of elements to which potassium belongs is _ _ _ _ _. Question 8: Which of the following factors does not affect the metallic character of an element? Question 9: Lanthanides and actinides are also called _ _ _ _ _. Question 10: The family of elements to which calcium belongs is _ _ _ _ _. Question 11: The modern periodic table is given by _ _ _ _ _. Question 12: The family of elements having seven electrons in the outermost shell is _ _ _ _ . Question 13: A liquid non-metal is _ _ _ _ _. Question 14: The first alkali metal is _ _ _ _ _. Question 15: A purple coloured solid halogen is _ _ _ _ _. Question 16: Six elements A, B, C, D, E and F have the following atomic numbers (A = 12, B = 17, C = 18, D = 7, E = 9 and F = 11). Among these elements, the element, which belongs to the 3rd period and has the highest ionization potential, is _ _ _ _ _. Question 17: The least reactive element in group 17 is _ _ _ _ _. Question 19: The valency of chlorine with respect to oxygen is _ _ _ _ _. Question 20: Elements belonging to groups 1 to 17 are called _ _ _ _ _. Question 21: Four elements along a period have atomic number (11, 13, 16 and 17). The most metallic among these has an atomic number of _ _ _ _ _. Question 22: A factor that affects the ionisation potential of an element is _ _ _ _. Question 23: The property of an element in the periodic table depends on its, _ _ _ _ _. Question 24: The element, which has the highest electron affinity in the 3rd period is _ _ _ _ . Question 25: Down a group, the electron affinity _ _ _ _ _.